In this digital age, it seems like we keep getting busier.. and busier.. and busier! That’s why we want to make it as easy as possible for our clients to get the service they deserve both in person and online. We have added new features to our Facebook page, have medical records available online for established clients, and so much more. On Facebook, you can now request food refills, RX refills, appointments, etc. On Pinterest, you can view some of our great clients, learn tips from our vets, and view other vet approved recipes and tips. You can even follow us on Twitter to see news from our Facebook feed including pet food recalls, canine influenza updates, etc. We live in a digital age, and we want to make taking care of your pet as easy as possible. Having problems logging into PetSites or finding our Facebook page? Give us a call at 540.343.4155! Learn how to take advantage of our Facebook features! With the fourth of July right around the corner, we are letting our friends at the ASPCA give some very important tips! Please read below for their great insights! The heat is on in the Roanoke Valley! With our high temperature approaching triple digits, we want to address pet safety during the hottest season of the year. 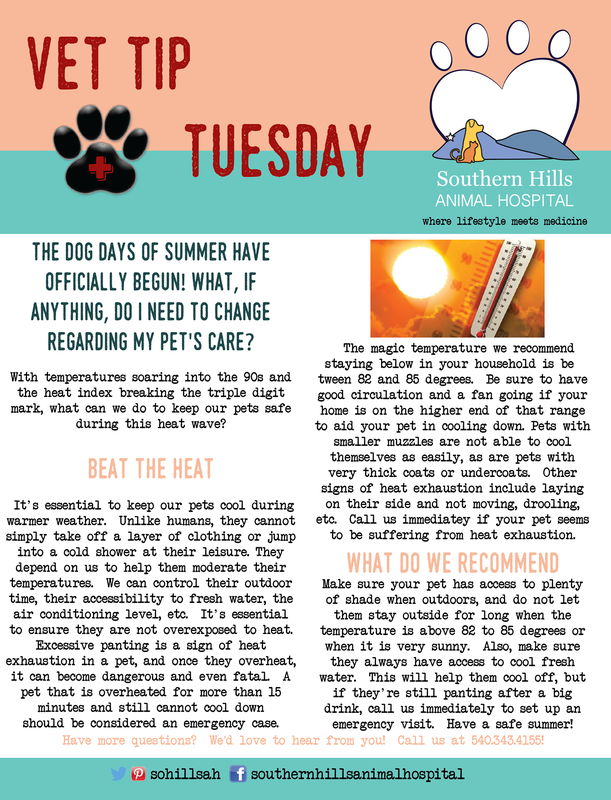 Check out our Vet Tip Tuesday flyer about pet health and the changes you might want to consider making during warmer weather. One of the best things about our jobs is the ability to watch puppies grow and develop the best personalities! Meet Lizzie, a gorgeous lemon beagle. She has been coming to us since she was itty bitty, and she has become quite the bouncy little ballerina. Be sure to check back weekly! We will feature more great clients on a regular basis. Next week, we begin a new month. Can you believe how quickly this year is flying by?! We can’t! Feel free to print off a copy for yourself or to share it with friends! 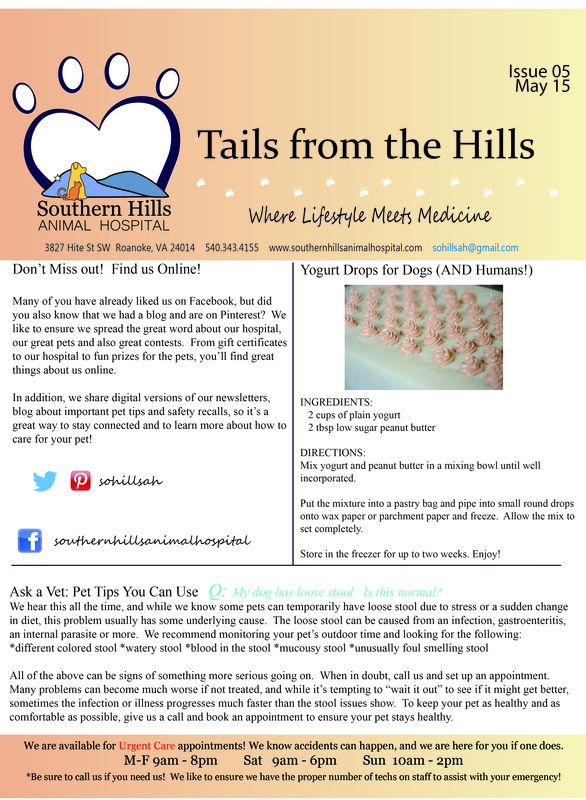 This month, we are showing off our social media outlets, sharing another frozen treat recipe that even YOU might try and discussing a common topic, loose stool for dogs. To read the information here, see below, and happy reading! Don’t Miss out! Find us Online! Many of you have already liked us on Facebook, but did you also know that we had a blog and are on Pinterest? We like to ensure we spread the great word about our hospital, our great pets and also great contests. From gift certificates to our hospital to fun prizes for the pets, you’ll find great things about us online. In addition, we share digital versions of our newsletters, blog about important pet tips and safety recalls, so it’s a great way to stay connected and to learn more about how to care for your pet! Put the mixture into a pastry bag and pipe into small round drops onto wax paper or parchment paper and freeze. Allow the mix to set completely. Store in the freezer for up to two weeks. Enjoy! Q: My dog has loose stool. Is this normal? All of the above can be signs of something more serious going on. When in doubt, call us and set up an appointment. Many problems can become much worse if not treated, and while it’s tempting to “wait it out” to see if it might get better, sometimes the infection or illness progresses much faster than the stool issues show. To keep your pet as healthy and as comfortable as possible, give us a call and book an appointment to ensure your pet stays healthy. This type of injury/condition happens much more often than you would think! Today, we will go over the do’s, the don’ts and a few of the most common reasons as to why your pet might be limping. Please keep in mind, diagnostics like radiographs might be needed! Soft Tissue Injury: These injuries often happen if your pet jumps, lands the wrong way, runs too hard, etc. Most of the time, these injuries can be treated easily with an anti-inflammatory that you take home as well as injections to get into their system faster. ACL Tear/Injury: These injuries are more serious than soft tissue injuries and can often require further diagnostics and/or surgery. Please be sure to contact your vet immediately if you suspect one of these injuries. Lymes Disease: Believe it or not, but there is a disease than can cause limping. Most of the time, your pet might lift their paw up and hold it up when Lymes Disease is present. This disease is transmitted to your pet through ticks, so it’s important to keep your pet on tick preventive (we sell Parastar Plus, a topical treatment, in our office). In addition, if you find a tick, we can perform a tick screening test to see if any of their diseases were passed along to your pet. It is essential to catch Lymes Disease early because it is treatable through antibiotics. Paw Pad Cut/Injury: These injuries include cuts, thorns being stuck, burns, slices, cracks and much more. These will often require us to shave down and clean the wounded area and a round of antibiotics/topical ointments to ensure an infection does not set in. 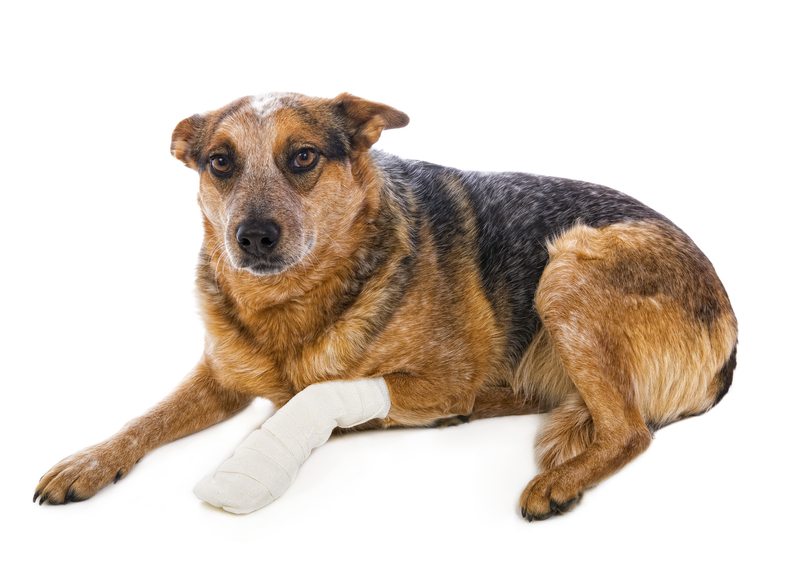 Also, anti-inflammatory medications and/or injections might be used to ease your pet’s pain. This week, we are featuring this handsome fella, Bruiser! 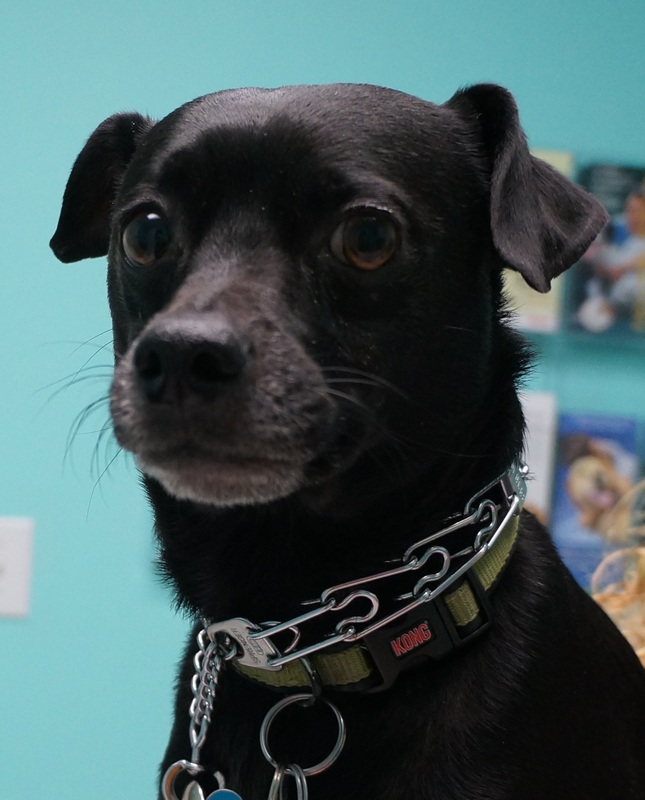 Bruiser is a wonderful miniature pinscher mix and has such a great personality. He’s playful, friendly and is always so well behaved for us. It’s adorable to see his serious deep brown eyes when he gets all excited! Be sure to check back each week to meet more of the wonderful pets we are lucky to care for. Just imagine this. Tails waggin’, dogs smiling, picture taking, treat eating, brownies, custom bandanas… wait, did we say brownies?! We think that’s enough to draw you in! We’re participating in SW Virginia’s largest pet expo on Saturday, May 16 at the Berglund Center. It’s a one day event where different vendors set up shop to give away fun goodies and information for you and your furry friends. 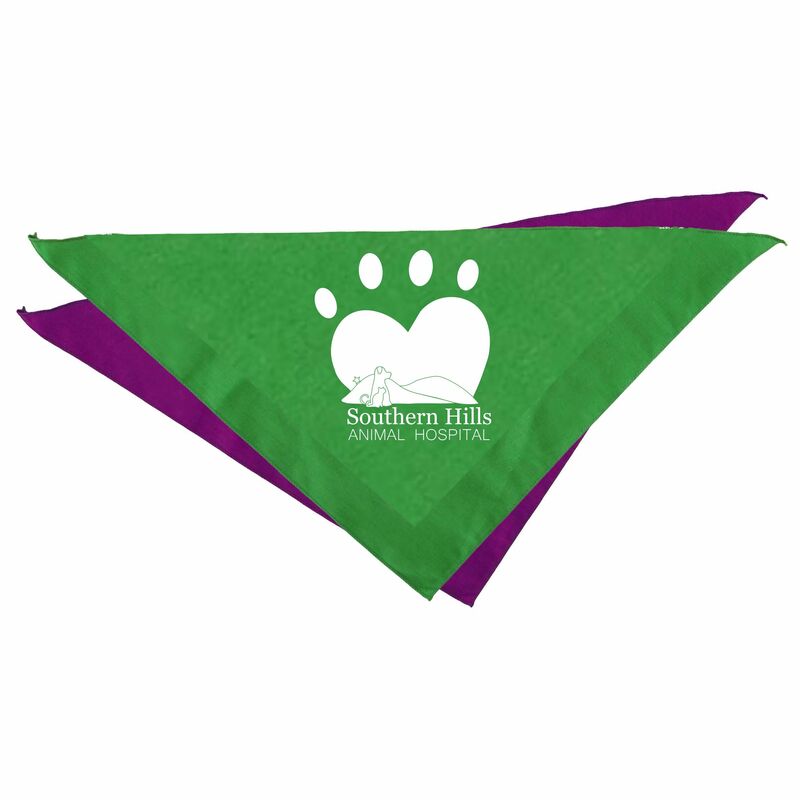 At our booth, we’ll have fun props for a photo booth style photo opportunity, delicious treats for dogs, door prizes, a gift certificate, custom bandanas and so much more. Need more info? Visit their Facebook page to learn more and be sure to give us a “like”, too! It’s another month, so that means another newsletter jam-packed with a recipe, news you can use and tips for our furry friends. 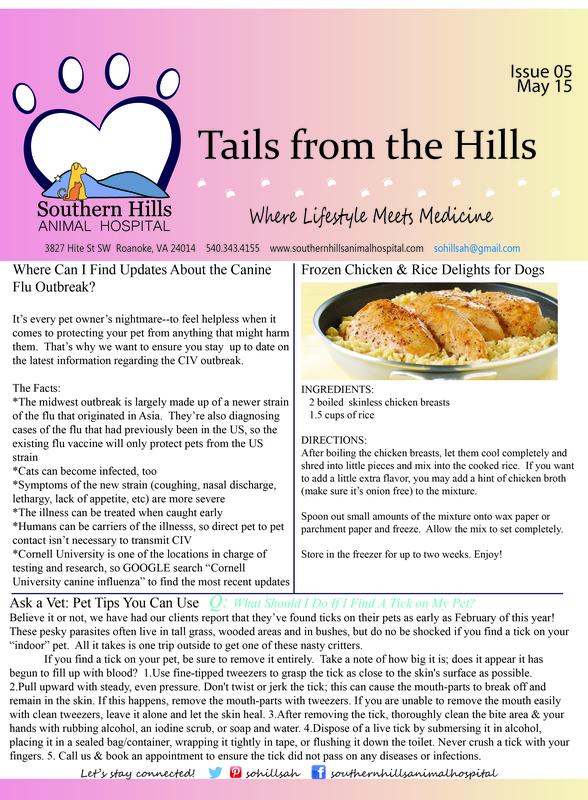 This month, we’re tackling how to search for canine influenza updates, giving you a chicken and rice treat that you might even be tempted to try, and finally, we’re discussing all things ticks. Above is the newsletter itself, and it can also be found on our Pinterest page! However, if it’s easier to read on our blog, put your paws together because we have copied and pasted all of the information below! Woof! Where Can I Find Updates About the Canine Flu Outbreak? It’s every pet owner’s nightmare–to feel helpless when it comes to protecting your pet from anything that might harm them. That’s why we want to ensure you stay up to date on the latest information regarding the CIV outbreak. After boiling the chicken breasts, let them cool completely and shred into little pieces and mix into the cooked rice. If you want to add a little extra flavor, you may add a hint of chicken broth (make sure it’s onion free) to the mixture. Spoon out small amounts of the mixture onto wax paper or parchment paper and freeze. Allow the mix to set completely. Ask a Vet: Pet Tips You Can Use: What Should I Do If I Find a Tick on My Pet? Believe it or not, we have had our clients report that they’ve found ticks on their pets as early as February of this year! These pesky parasites often live in tall grass, wooded areas and in bushes, but do no be shocked if you find a tick on your “indoor” pet. All it takes is one trip outside to get one of these nasty critters. If you find a tick on your pet, be sure to remove it entirely. Take a note of how big it is; does it appear it has begun to fill up with blood? 1.Use fine-tipped tweezers to grasp the tick as close to the skin’s surface as possible. 2.Pull upward with steady, even pressure. Don’t twist or jerk the tick; this can cause the mouth-parts to break off and remain in the skin. If this happens, remove the mouth-parts with tweezers. If you are unable to remove the mouth easily with clean tweezers, leave it alone and let the skin heal. 3.After removing the tick, thoroughly clean the bite area & your hands with rubbing alcohol, an iodine scrub, or soap and water. 4.Dispose of a live tick by submersing it in alcohol, placing it in a sealed bag/container, wrapping it tightly in tape, or flushing it down the toilet. Never crush a tick with your fingers. 5. Call us & book an appointment to ensure the tick did not pass on any diseases or infections. We offer numerous products and services to help keep your pet’s weight in check! 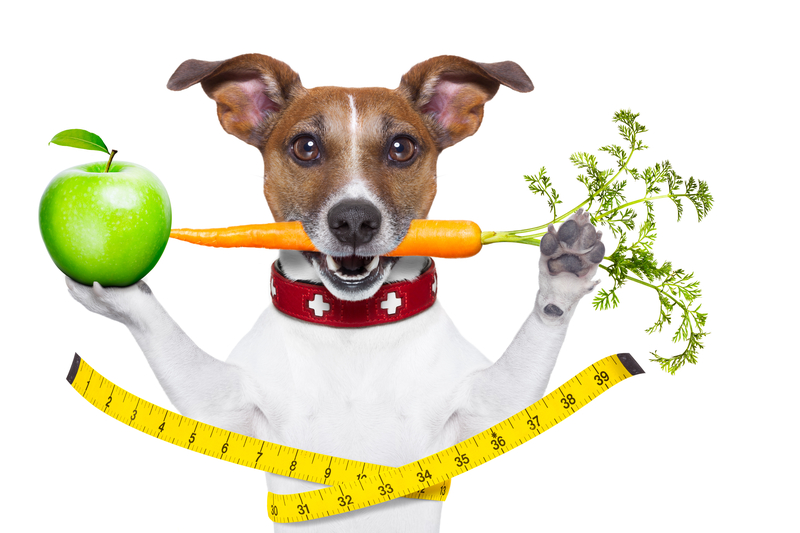 proper nutrition We sell several types of food that will help your pet maintain their healthy weight or lose weight when necessary. They include diets that are formulated to be “moderate calorie” diets in order to ensure your furry friend gets a reduced daily calorie count without sacrificing other nutritional needs. These diets are vet approved and have become favorites for many of our clients and their pets! 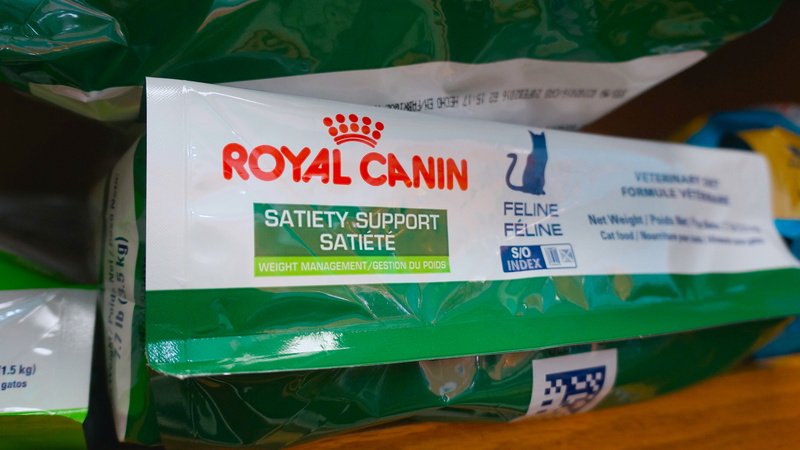 In addition, some of the have extra benefits like joint support; this helps, as extra pounds can really cause extra stress on your pet’s joints. It’s our philosophy that it’s essential to care for the WHOLE pet. This means evaluating their behavior, their diet, their socialization and so much more. That’s why we offer nutritional consultations. We take the time to learn more about your pet’s needs, their eating habits, their activity levels and your concerns as the owner. We take these into consideration and offer our advice regarding their diet. 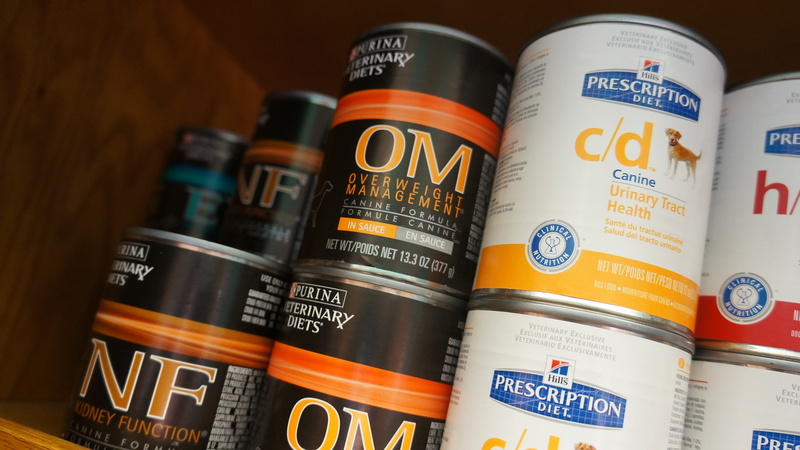 If one of our prescription foods is the best option, we will do our best to provide a sample for your pet to try!